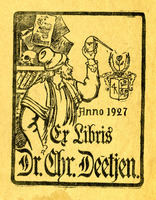 Dr. Georg Adolph Christian Deetjen (1863-1940), was a graduate of the University of Würzburg where he attended lectures delivered by Wilhelm Konrad Röntgen. He came to Baltimore as one of the earliest specialists in radiology, working at the Maryland Medical College, Maryland General Hospital, and the Howard A. Kelly Sanitorium. Deetjen lost several fingers and finally a hand due to radiation exposure and died after much suffering on December 28, 1940. After Deetjen’s death, his extraordinary collection of rare works on witchcraft, demonology, and magic was offered for sale and purchased by the Boston Medical Library in April 1942—some 150 titles in all. Notable items in the Deetjen Collection include five editions of the juridical text, the Malleus maleficarum, including one incunable, along with works by Herman Coehausen, Francis Bragge, and Lewes Lavater, and other imprints from the 16th through the early 20th century. A number of works in the collection were presented or inscribed to Christian Deetjen by his friend, journalist H. L. Mencken.